How can you get an objective look at your customers’ opinion of your company? From October 1, 2016 to September 1, 2017, our customers posted 199 reviews of our products on the Gartner Peer Insights portal. And based on our customers’ opinions, we received the Platinum Award as part of the 2017 Gartner Peer Insights Customer Choice Awards for Endpoint Protection Platforms. Of course, the first thing that comes to mind when Gartner is mentioned is the company’s “Magic Quadrants.” One of the objectives of that format is to help customers choose the right solution. However, it’s important for businesses to know more than just what analysts think about IT products. They’re also interested in the opinion of direct users of these solutions in real life. So just a little over a year ago, Gartner presented something different — Gartner Peer Insights. Unlike a Quadrant, where a company’s position in the market is depicted not by a rating, but by the relative position of a company on a graph, the essence of Gartner Peer Insights is that customers themselves, and not Gartner analysts, rate their vendors’ IT solutions and publish their surveys on a special website. A lot of factors affect the final rating: product quality, the sales department’s customer service, and the professionalism of the technical support desk. Our solution was reviewed in the Endpoint Protection Platforms category and was recognized by end users. The key differences are credibility and transparency. Gartner doesn’t just collect comments about products; the company’s analysts also ensure that the surveys are written by real employees of companies where the solutions are actually used. All materials are available on the website, but without the authors’ names. Gartner also ensures that comments from different regions and from companies of various sizes doing business in different industries are taken into account. This helps prevent companies with single-purpose solutions relevant only on a specific market and for a specific industry ending up in the rating. Gartner places special emphasis on the scale of the companies — at least half of the comments must be written by representatives of enterprise companies. Details of the Peer Insights methodology are available on the Gartner website. We should add that this is the first time customer choice awards for the endpoint protection platform segment have been published, so we were the very first recipients of the platinum award in this category. We’re very grateful to Gartner and our customers for this honor. 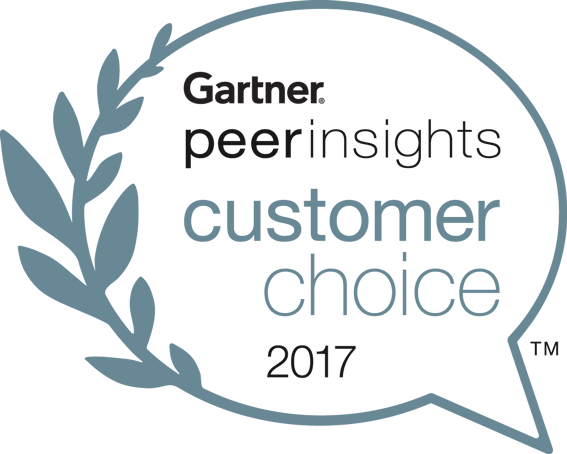 The Gartner Peer Insights Customer Choice Award Logo is a trademark and service mark of Gartner, Inc., and/or its affiliates, and is used herein with permission. All rights reserved. Gartner Peer Insights Customer Choice Awards are determined by the subjective opinions of individual end-user customers based on their own experiences, the number of published reviews on Gartner Peer Insights and overall ratings for a given vendor in the market, as further described here http://www.gartner.com/reviews-pages/peer-insights-customer-choice-awards/ and are not intended in any way to represent the views of Gartner or its affiliates. Is blockchain compatible with privacy?